← UN FORUM SERIES – How do technology companies integrate freedom of expression and privacy rights? This post was contributed by Teresa Fogelberg, Deputy Chief Executive at GRI. The post was written in her personal capacity. This Monday, on the eve of the 4th Annual United Nations Forum on Business and Human rights in Geneva, I had the honor of launching the new GRI Linkage Document: Linking G4 and the UN Guiding Principles: comply with the UN Guiding Principles on Business and Human Rights through G4 reporting. The timing was very appropriate. This year’s Annual Forum in Geneva, convening more than 2000 human rights experts, focuses on the initial results of the UN Guiding Principles, and measuring its progress. Our new linkage document fits nicely within this theme. Although there are some caveats on the comparability, some interesting figures surfaced. Disclaimer. The information relates to a sample of G4 Reports with a declared ‘in accordance’ option, available in the GRI Sustainability Disclosure Database. Report registration is a voluntary process and the Database captures reports that GRI is aware of at a particular point in time. The Database is updated on a daily basis. The analysis has been performed based on the information available in the GRI Content Indices of the examined G4 Reports. The content of the reports has not been reviewed. And almost one third (approximately 30%) of the companies reported on the issues of freedom of association, child labor, supplier human rights assessments, forced labor, and grievance mechanisms. 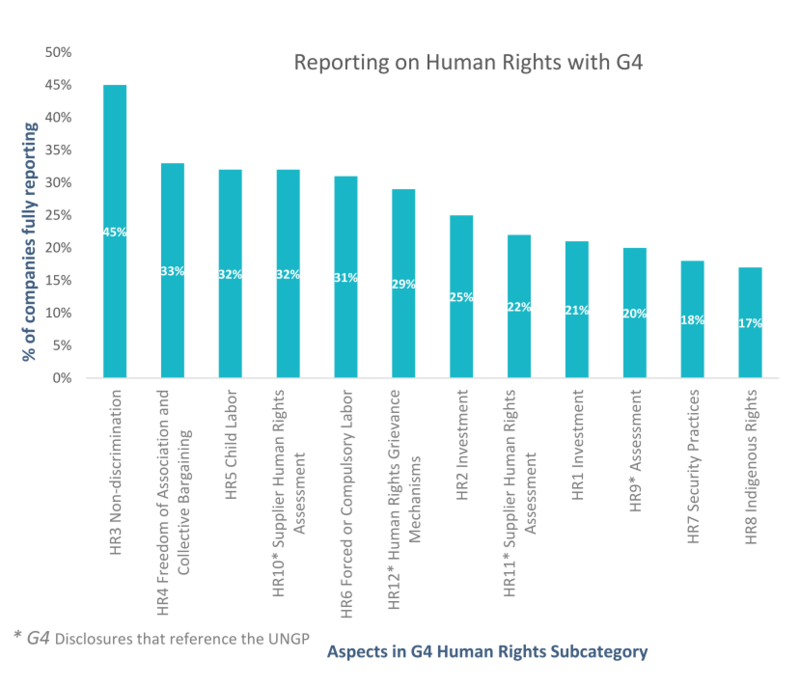 One third of the reports include UNGP linked human rights indicators. The most frequently reported issue is Non-Discrimination (45%); the least reported is indigenous rights (17%). A quarter of all companies report that they train their employees on human rights policies or procedures. And 22% report that they have encountered significant actual human rights impacts in their supply chain and have taken action to remedy those impacts. Is the glass half empty or half full? I was myself pleasantly surprised by these numbers, and in particular by the disclosure of significant actual human rights impacts ‘on the ground’. After all, it takes more guts to disclose failures than to describe internal management processes and policies. And I feel heartened by the fact that a relatively large group of companies invest in training of their employees in this field. As the sustainability reporting trend continues to increase, companies continue their transition to G4 and the number of G4 reports in the database increases, GRI will be able to spot the trends and compare them by region and sectors. This is only a starting point and as GRI continues compiling G4 reports, these statistics will become more significant and representative. The linkage document can be found on our website here: Linking G4 and the UN Guiding Principles. Teresa Fogelberg is Deputy Chief Executive at the Global Reporting Initiative. As GRI’s Deputy Chief Executive, Teresa engages in strategic external relationships with businesses, governments, civil society and other stakeholders. This entry was posted in Reporting and tagged business, gri, guiding principles, human rights, linkage, reporting, teresa fogelberg. Bookmark the permalink.